Home » Health » Secret Weapon Against Cancer, Fat and Heart Diseases! Homemade Sauerkraut Recipe! Secret Weapon Against Cancer, Fat and Heart Diseases! Homemade Sauerkraut Recipe! Sauerkraut, or sour cabbage, has numerous health benefits which have been scientifically proven, and the most important of them is that it improves digestion, and prevents cancer, stroke, and heart attacks. Due to the souring process, sauerkraut has probiotic properties. The natural fermentation provides good bacteria to the digestive system, and it is advised that you eat sauerkraut after an antibiotic therapy, in order to restore the healthy bacteria in your intestines. In the old days, sailors constantly had sauerkraut on their cruises, due to the fact that it is rich in vitamin C, and prevented scurvy that was caused by a vitamin C deficiency. A study showed that the consumption of fermented foods, such as sauerkraut, is beneficial in the process of losing weight, especially in the waist-hip area! Namely, fermented foods positively affect metabolism. In particular, the fermentation of the cabbage has been shown to treat inflammatory processes, lipid metabolism and prevents obesity. Flavonoids – Sauerkraut contains flavonoids which prevent damage and narrowing of the arteries. Glucosinolate – This ingredient of sauerkraut stimulates the activation of the natural antioxidant enzymes in the body. Isothiocyanate – This ingredient provides strong anti-cancer benefits. Sauerkraut is high in minerals which promote bone health and prevent the development of osteoporosis. Also, vitamin K keeps the bones healthy and controls the protein production, which are needed for maintaining the bone mineralization. Therefore, you may enjoy numerous health benefits if you start consuming sauerkraut. However, due to the food pasteurization laws and the canning process, the majority of sauerkraut you can see on store shelves lacks its beneficial bacteria, as they have been destroyed by the heat. Therefore, you should try and consume your own sour cabbage, which is simple to prepare and will help you save some money. You should core the cabbages and use a food processor to shred the rest. Then, toss the cabbage and salt together in a large bowl, and “knead” them together with the hands in order to break up its cellular structure. 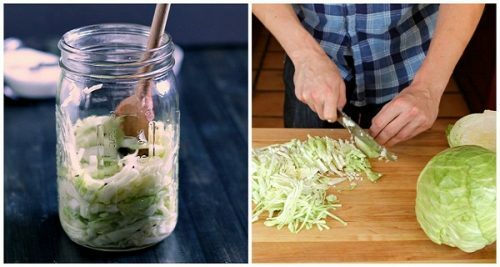 As soon as you do this, the cabbage will start releasing juices and become limp, so you should quickly pack it tightly into a sauerkraut crock or vegetable fermenter. In case you do not have one, you can pack the cabbage in a large glass jar, and use a wooden spoon to pound it down. Continue until it is submersed in liquid. Note that this is crucial, as the solid materials should rest below the liquid when preparing fermented foods, in order to prevent them get contaminated by molds, yeasts or stray microbes from the air. In the end, cover it loosely and leave it to ferment, for at least a month, to half a year, depending on your preferences. You should remember to check it every couple of days, and as soon as it has the taste you like, you should store it in your fridge and keep there for at least half a year. In the case you notice a scum on its top, remove it with a spoon.